The Crowne Plaza Abu Dhabi Yas Island sits in a commanding position. Gorgeous views of Yas Links with the endless blue of the Arabian Gulf stretching beyond make this a breath-taking golfers base. And with sumptuous interiors, a 25-metre outdoor pool, and numerous restaurants, bars and brasseries, the Plaza combines modern luxury with all the practical facilities you could need to complete your golfing holiday. There are five restaurants and two bars on offer at this elegant hotel, offering buffets, brunches, live music and cuisine to suit every taste. If it’s Arabic and Lebanese food you’re after though, look no further than Barouk. With its glorious shisha garden overlooking the Arabian Gulf, it’s the perfect place for a night out with friends. Find all the island’s attractions at your feet, from the thrills and spills of Ferrari World and Yas Waterworld to the shoppers’ paradise of Yas Mall. Ascot Golf packages are based on All-Inclusive Meal Plans, with Abu Dhabi Airport Transfers and Yas Links Transfers included. PGA Golf Professionals Stay & Play for FREE at Crowne Plaza Abu Dhabi Yas Island with every 7 paying golfers. Listed Package Prices: Listed Golf Package prices apply with PGA Pro FREE. Listed Golf Package prices at Crowne Plaza Abu Dhabi Yas Island are based on All-Inclusive Meal Plan. as shisha in a tranquil garden overlooking the Gulf. cuisine with live cooking stations. enjoying a variety of refreshing beverages included with your Ascot Golf Package. Listed Package Prices: Listed Golf Package prices apply with All-Inclusive Meal Plan. Jing Asia: All day dining restaurant offering the best of International cuisine alongside a selection of live cooking stations and friendly service. Surf n Turf Night: every Thursday. International Brunch: every Friday. Stills Bar & Brasserie: Serving delicious European gastro pub food, a wide variety of international draught beer and an extensive whiskey range, Stills has something for everyone's taste. Kindly note that for entry to our Thursday ladies night, only original passport, Emirates ID or UAE driving license for local residents and only original passport for visitors from outside the country will be accepted. Barouk: Experience a true Arabic evening in our Award Winning authentic Lebanese restaurant. Enjoy delicious mezze, our fabulous mixed grills, and customer favorites such as Fish Tajine. Our talented musicians creates a relaxing environment, and on weekends, he will sing traditional favorites for your enjoyment. After dinner, enjoy the shisha garden overlooking the romantic setting of the moon shimmering on the Arabic Gulf waters. A true authentic Middle Eastern experience not to be missed! Sundowner Pool Bar: Relax, sit back and soak up the sun at this cool hotspot by the pool. Sundowner serves an exciting variety of refreshing beverages and light snacks. Views Lobby Lounge is the perfect place to meet and connect over afternoon tea or early evening cocktail with magnificent views across the golf course and Arabian Gulf. Maintaining your routine while traveling is important, especially when you’re short on time and on the go. The right workout—right when you want it—helps you stay focused, energized and on top of your game. So, recharge and feel ready for anything with our fully equipped fitness center and wellness options at Crowne Plaza Abu Dhabi Yas Island. Spa On-Site Spa is available to guests at Crowne Plaza Abu Dhabi Yas Links. Take a journey of relaxation and rejuvenation of your choice with our aromatherapy oils or candle massage. Let our therapist diagnose you on what your body really needs to be revived and restored. Yas Links opened in March 2010 as the first Links Course in Abu Dhabi with dramatic views over the Arabian Gulf. Yas Island is a unique environment - home to a rich ecosystem of bird and marine life. These coastal habitats provide a special background to an extraordinary links golf course, and a truly world-class golf club. Just as the course itself is unique, so are the stunning coastal views from a variety of vantage points in the main Andalucía-styled clubhouse. Enjoy fine dining, a relaxed drink, personalised pampering in the locker room, a few lengths in the pool or unrivalled service in the numerous facilities. Yas Links is located on Yas Island, 30 minutes from Abu Dhabi, 60 minutes from Jebel Ali Dubai. 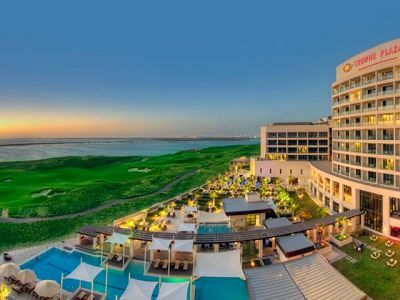 Saadiyat Beach GC is superbly located on the beachfront of Saadiyat Island – just 5 miles north of Abu Dhabi and 75 minutes from Jebel Ali Dubai. Opened in March 2010, The Gary Player Design Championship course provides one of the most challenging in the golfing world to date. The course has been designed to entice golfing enthusiasts from around the world with some of the most spectacular golf hole designs overlooking the Arabian Gulf. The Course held the Saadiyat Beach Classic in January 2010; hosted by Gary Player it featured golfing and non-golfing celebrities including Rory Mcilroy and Darren Clarke. After your round, golfers can enjoy the wonderful Hawksbill Restaurant - named after the protected turtle species that use Saadiyat Island as a hatching spot. The Hawksbill restaurant situated in the Academy Building, provides a truly unique dining experience and a refreshing alternative to the obligatory post-game quick bite and beverage. The National Course at Abu Dhabi Golf Club provides a tough but fair challenge, with lush fairways, strategically placed bunkers and generous greens. The championship course weaves through undulating terrain that features palms, ornamental trees and shrubs, as well as seven saltwater lakes. An additional 9-hole course is also available at Abu Dhabi for less experienced players.